Elevator is out of service. Always be informed on everything in your building. Invisible to search engines, no data sharing. Only for real people connected to your building. HomeBeat.Live (standard version) is free of charge. Always up to date, easy to use & available on any device. The fact that I can notify both residents and the property manager in one click is just brilliant! Makes reporting malfunctions easy. We switched from a simple WhatsAppTM group to HomeBeat. It's simply a great tool and much more fitting to our needs in the building. Ever since we use HomeBeat.Live we've grown from being strangers in the same building to real neighbours. It’s now much easier to arrange pick-up of DHL parcels which neighbours accept on my behalf. A simple HomeBeat.Live message does it. Locked myself out. Luckily I had HomeBeat.Live with careful instructions on what to do. Saved me a lot of time and money! That early notification about the garage exit being blocked, enabled me to arrange for a taxi in time. It saved my business meeting. Communication has really improved in our building. Knowing I have everything at my fingertips brings me peace of mind. Finding someone to take care of my darling cats and to water the plants while I'm away travelling, was never easier! For safety, you need to be vigilant. It's a fantastic feeling, when you know your neighbours watch out for you. Tired of not knowing what’s going on in your building? Hard to get hold of service providers? Don’t know your neighbours? HomeBeat.Live is your private, contemporary platform to bring full transparency, create a vibrant community and a better run property. Have a look at the extensive feature list and user testimonials. And the best thing… it's free of charge. Start today! 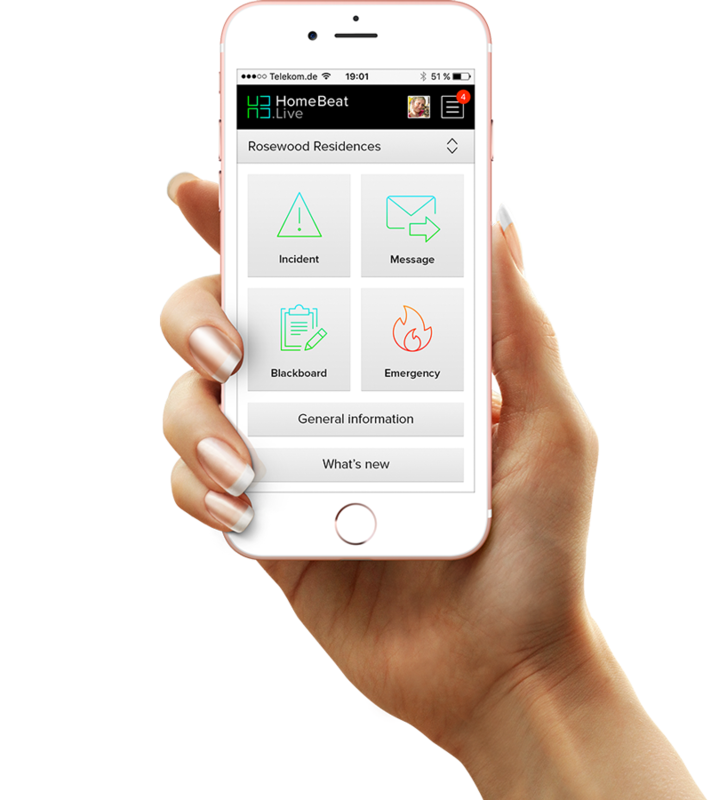 HomeBeat.Live provides an easy way to bring your owner community into the digital age. Enhance the quality of life in the building and assure a better management. The contemporary platform offers a wealth of advantages: higher overall transparency, increased safety and considerable potential for lowering costs. With HomeBeat.Live you also support the property manager by eliminating duplicate calls when something is out of order and by making it easy for him to provide feedback. Find out how HomeBeat.Live can make your owner community better, it’s free! Digitalisation is both a challenge and an opportunity. HomeBeat.Live offers you a smart way to get ahead easily, without any overhead nor investment. The innovative building-centric platform will excite your customers and help you save a lot of valuable time. 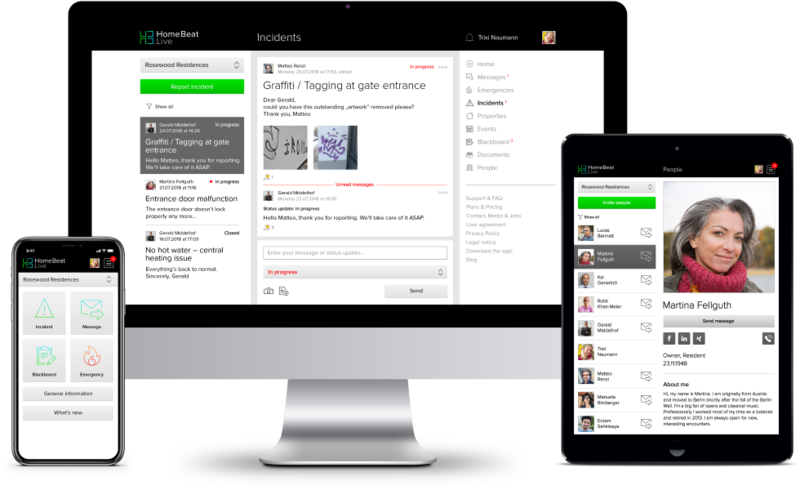 Duplicate incident notifications and phone calls will be significantly reduced whilst greatly improving customer satisfaction. Make easy and modern communication an effective USP to your business. Demanding new construction projects require future-proof solutions that sustainably increase the value of these properties. With HomeBeat.Live you lay the cornerstone for further digitization of the building. At the same time you can use the infrastructure to facilitate communication regarding construction progress or to simplify follow-up management. Discover how HomeBeat.Live supports your business.